How do you use the new CrisisAlert app in your work? 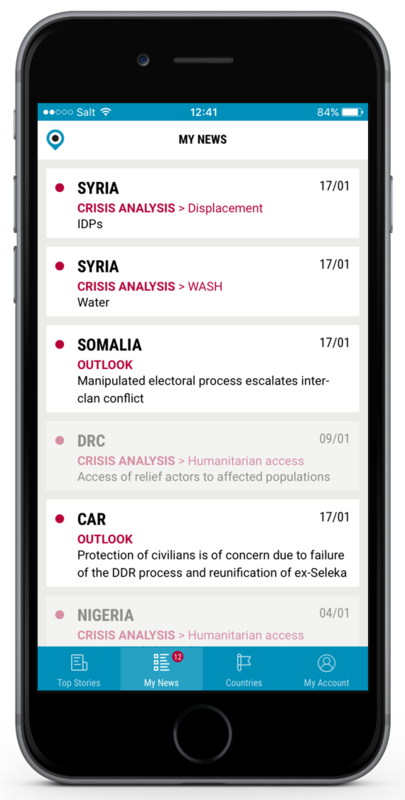 We recently launched our new app aimed at updating humanitarian workers on the most pressing humanitarian crises in the world. One month after the launch we are very happy to see that more than 2,200 people have installed it. Five different ways of using the app! It provides a useful platform to stay up to date with current developments or changes within countries specific to individual team members and their regions. Additionally, the offline features make it especially valuable on deployments, short or long. It really makes Information Management products accessible to a wide range of users. The app and the information in it is very useful. We use it to update the deployees that are going to the field at any given time. At the moment, we have over 200 persons deployed through NORCAP. Each is briefed about the updates for each country. I use ACAPS Crisisalert app daily to get information on different countries. It provides quick, reliable and updated analysis from crisis areas. This app is very useful in my daily work to monitor the situation or to use as a reliable tool when I’m deployed. I get instant alerts whenever there is a new report or new updates on crises. Having information directly on my phone, even without connection allows me to read the content when I’m in the field. CrisisAlert app is very useful. I and colleagues of the same level are basically managing our country programs in various locations globally from the HQ here in Geneva. We do travel a lot and get updates from the teams regularly but this extra layer of alerts, updates and information is really good to have. Help us improve the app: take our quick survey!